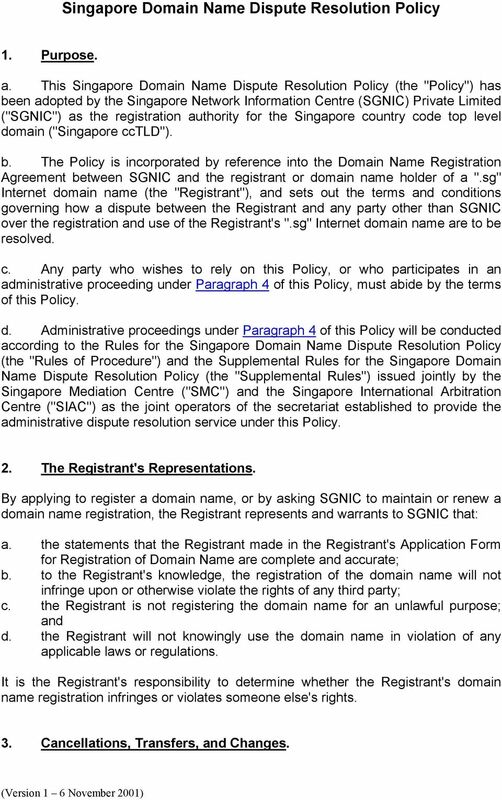 Download "Singapore Domain Name Dispute Resolution Policy"
Policy Adopted: August 26, 1999 Implementation Documents Approved: October 24, 1999 Notes: 1. This policy is now in effect. See www.icann.org/udrp/udrp-schedule.htm for the implementation schedule. 2. THE POLICY. 2003-2013 MYNIC BERHAD. All rights reserved. FREQUENTLY ASKED QUESTIONS 1. 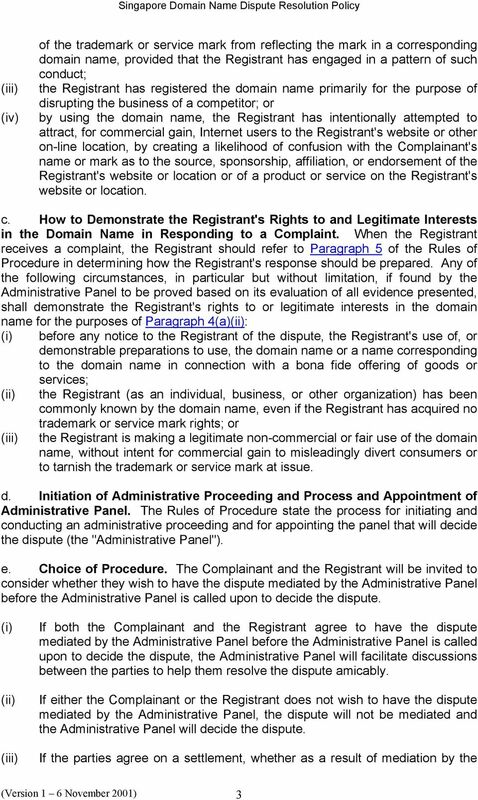 To which disputes does the HKDNR Domain Name Dispute Resolution Policy apply? 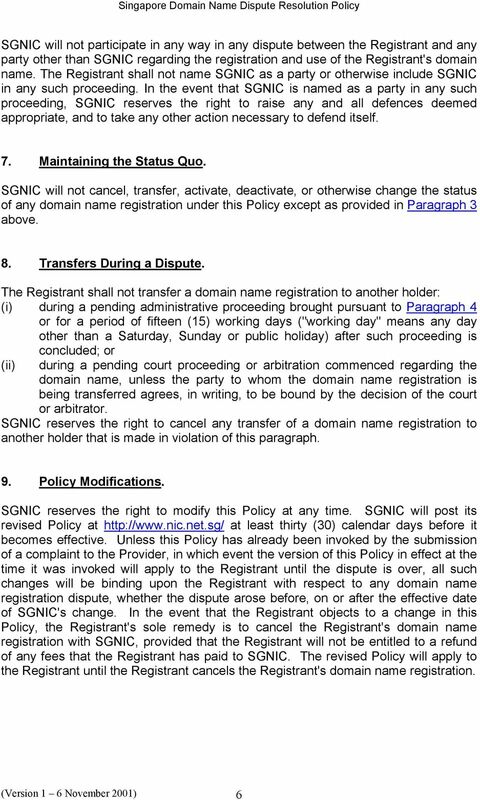 Answer: The HKDNR Domain Name Dispute Resolution Policy applies to.hk domain names disputes. THE RULES. 2003-2013 MYNIC BERHAD. All rights reserved. ADMINISTRATIVE PANEL DECISION Sanofi v. Domain Manager, eweb Development Group / ProxyTech Privacy Services Inc. / Privacy Manager Case No. Domain Names & Trademarks: UDRP Fundamentals in the Context of Real-World Cases Christopher R. Smith and Garrett M. Weber Internet Structure Basics ICANN -Internet Corporation for Assigned Names and Numbers. REGISTRY RESTRICTIONS DISPUTE RESOLUTION PROCEDURE (RRDRP) 1 4 JUNE 2012 1. Parties to the Dispute The parties to the dispute will be the harmed established institution and the gtld registry operator. 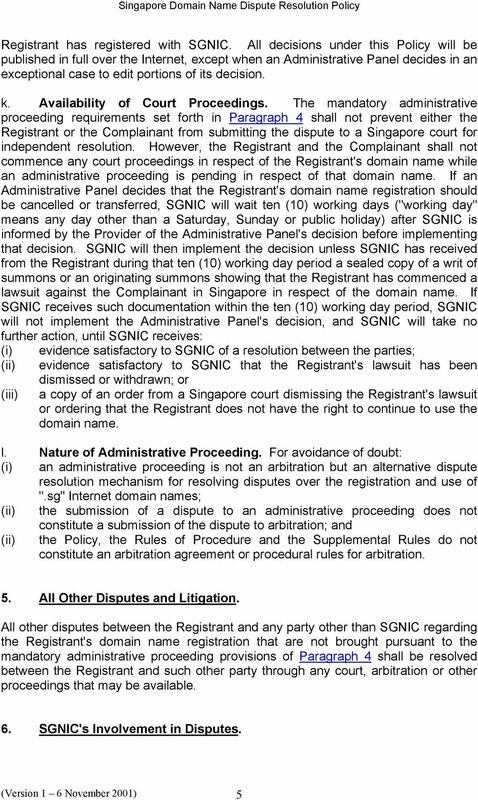 ICANN s Internet Domain Name Dispute Resolution Mechanism Hemmed in by Domestic Courts? (11 December 2015 to date) ELECTRONIC COMMUNICATIONS AND TRANSACTIONS ACT 25 OF 2002 Government Notice 1046 in Government Gazette 23708 dated 2 August 2002. Commencement date: 30 August 2002 [Proc. No. 1. "The Procedure" means the Trademark Post-Delegation Dispute Resolution Procedure (PDDRP). .scot Registration Policy Definitions This Registration Policy sets forth the terms and conditions, which govern.scot domain name registrations. 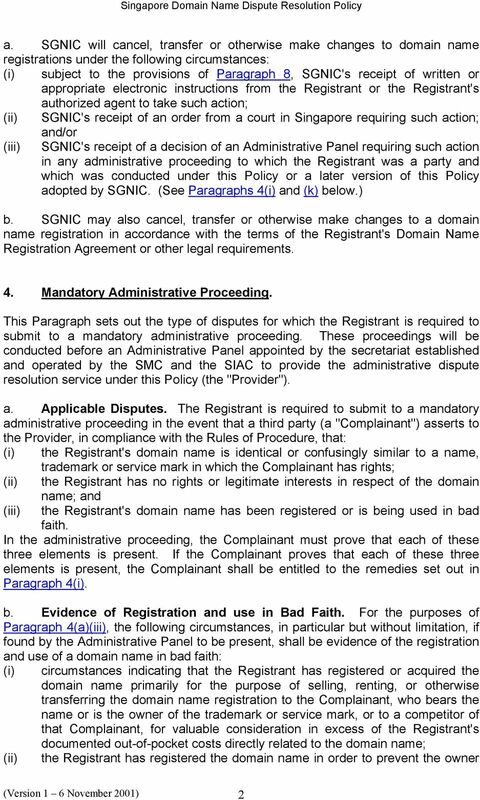 In this Registration Policy: a. Registrant, "You" and "Your"
Domain Name Policy. 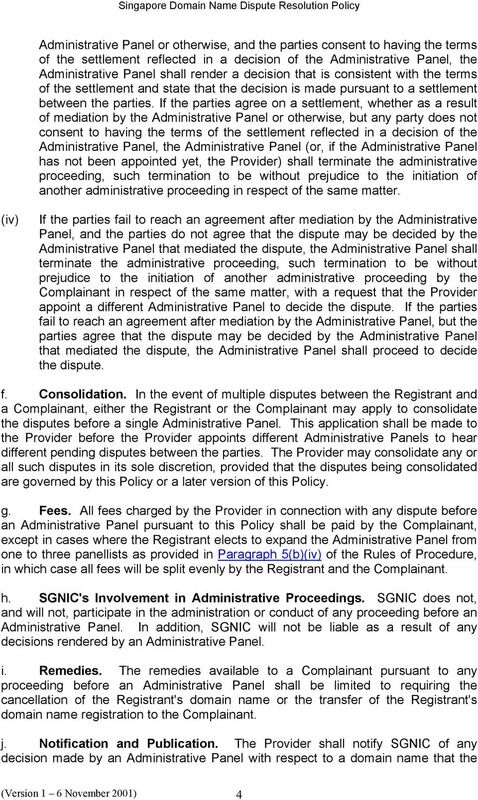 This Agreement explains our obligations to you, and explains your obligations to us for various Services. 1.2 Applicant means an entity who submits an application for registration. CANADIAN INTERNET REGISTRATION AUTHORITY DOMAIN NAME DISPUTE RESOLUTION POLICY DECISION. Sharon Groom, Daria Strachan, Peter C.
De2initions.gal Registration Policy This Registration Policy sets forth the terms and conditions, which govern.gal domain name registrations. In this Registration Policy: a. Registrant, "You" and "Your"
The Centre shall apply the Rules, the Policy and the Centre s Supplemental Rules in effect at the time a Complaint is submitted. DOMAIN NAME DISPUTES EDWARD E. SHARKEY 4641 MONTGOMERY AVENUE SUITE 500 BETHESDA, MD 20814 (301) 657-8184 ESHARKEY@SHARKEYLAW.COM WWW.SHARKEYLAW.